But our time is always limited, so on those weeks when time gets tighter, which of the three should we spend extra time on, and which of the three is it okay to spend a little less time on? Everyone has a different schedule, skill-set and needs, of course, but as a general rule, I’ve found the following to be true. The bigger the church, the more important it is to spend time honing our communication skills, the smaller the church the more time we need to spend fostering relationships. A church’s administrative needs obviously grow as the church gets bigger, but those can (and should) be delegated to others, so let’s look at the two aspects of leadership that most pastors will always have to do ourselves – the balance between communication and relationship-building. In a big church, the pastor will have name-recognition relationships with a very small percentage of the people they’re communicating to on a weekly basis. When you add writing, podcasting and other forms of communication, it’s typical for the pastor of a large church to have a personal relationship with fewer than one percent of the people they’re communicating with. But in a small church, the pastor will know most, if not all of the congregation members personally. Our lives are intertwined. So how does that affect our time management on the weeks when our schedule is especially tight (as in every week for a bivocational pastor)? 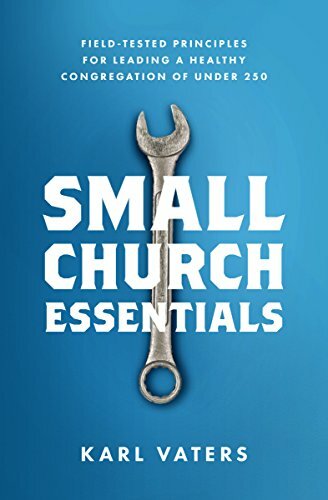 When a small church pastor has to choose between spending time on sermon prep, or interacting with congregation members, we should default towards people. When you’re speaking or writing to people with whom you don’t have a personal relationship, you need to work very hard on every word, every turn of phrase and every nuance of body language. Because they don’t know you personally (even if they feel like they do), your communication skills are the primary way you teach, inspire and build trust. So it’s important to spend extra time refining your communication skills, getting those nuances right and avoiding miscommunication as much as possible. But when you’re a small church pastor, you don’t need every word in your sermon or Bible study to be refined and precise because there’s far more discipleship, inspiration and trust-building done through relationships than from the pulpit.